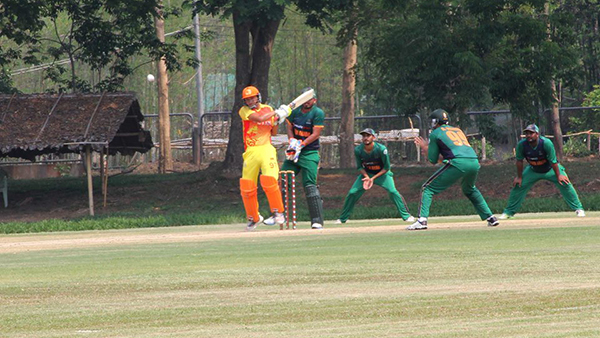 Bhutan lost to Saudi Arabia by six wickets, in the ongoing ICC World Cricket League Division One Asia Qualifier in Thailand, today. In the absence of Captain Jigme Singye, coach and player Damber Gurung stepped in his shoes for the match. Despite his efforts with the ball, Bhutan could not contain the Saudi batsmen chasing down the target in quick fire time. Batting first, Bhutan stumbled to a below par score of 97 runs. Four of Bhutan’s batsmen failed to break the duck. Shoaib Ali was the pick of the bowlers among the Saudi Arabians. He notched up a five wicket haul, conceding just 17 runs in the process. While Bhutan managed to take four wickets, Saudi Arabia comfortably reached the target of 98 runs in the 18th over. In other matches, Bhutan’s next opponent, Kuwait, made light work of Bahrain defeating them by 128 runs. On the other hand, China suffered yet another crushing defeat in the hands of Qatar. With the defeat and just two matches remaining in the tournament, Bhutan’s journey in this edition of the ICC tournament seems nothing but over.